The Haiti earthquake in 2010 deeply affected pilot Rodney Mullinax and his wife Jana. They knew they had to take an active role in the recovery of this devastated country. After prayer and consideration, the couple felt called to assisting missionaries that devoted their lives to assisting those in need. “Rodney had been flying since 2000 and the obvious path was for us to assist by transporting supplies using our aviation resources,” Jana explained. Since 2012, the couple has flown 21 cargo flights for nine different ministries in their 1967 Piper Cherokee Six. They estimate flying around 25,000 pounds of cargo to Haiti: including water purification units, tools, clothing, food, school supplies, Bibles, medical equipment and medications, a medical exam table, and Christmas shoebox gifts. Not all Rodney and Jana’s time is spent flying out of the country. They provide countless hours assisting domestically as well, providing medical transportation flights. One such flight included a 99 ½ year old woman and it was her first time in an airplane! They also transported an elderly woman to be with her son-in-law during the end of his battle with terminal cancer. She couldn’t have comfortably made the trip any other way. “People often thank us for what we do, but it is a blessing to us to be able to serve others in need,” Jana said. 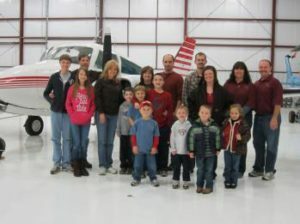 To see how you can help Flights for Christ or to learn more about their recent missionary flights, visit http://www.flightsforchrist.com/ or their Facebook page. For over 7 years, Flights for Christ has depended on the pilots at Aviation Insurance Resources (AIR) to insure their aircraft. Many pilots are concerned about the impact of charitable flying on their insurance policy. Our agents focus entirely on aviation insurance and guide you through the painless process of insuring an aircraft that may be used partially or entirely for missions like Flights for Christ. To discuss your aviation insurance needs, contact the experts at AIR at 301-682-6200 or submit a quote request online today! PreviousPrevious post:Berlin Airlift Aircraft Returns to the Skies as Flying MuseumNextNext post:What is a Breach of Warranty in aircraft insurance?